In honor of the recent release of The Beatles on iTunes, the insanely talented and criminally under-known Jeff Litman continued his Monday covers series with Two of Us. Stellar, Mr. Litman. In other Litman news, you have a few chances to catch him live. Check out your opportunities here. And of course, if you don't already have his Postscript album, download it here to rectify that shameful oversight. Don't thank me; thank Jeff. 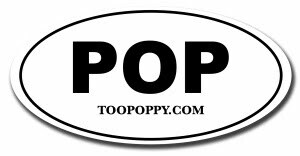 Too Poppy is the bomb!!! Thank you!